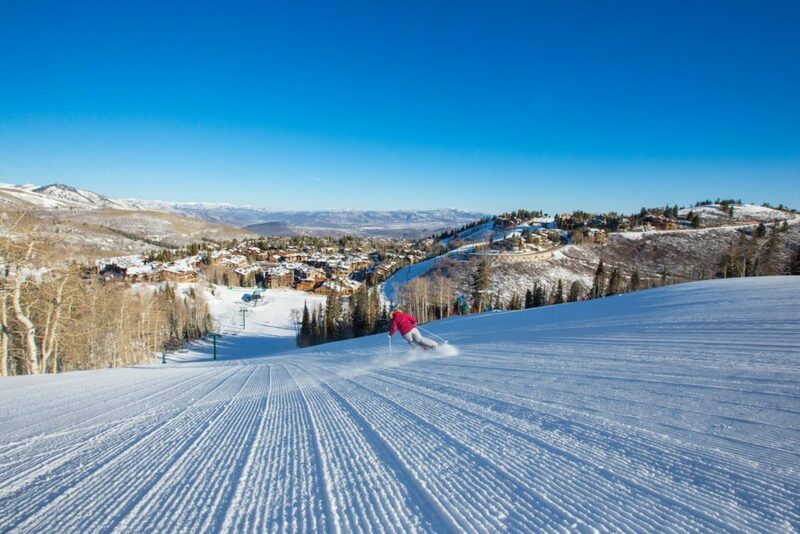 I’ll admit it, I was so excited about my first day of Deer Valley’s Women’s Ski Clinic that I leaped out of bed before 7, got myself and Little Guy ready to go, and shot out the door in record time. But I was so nervous that by the time I arrived at the welcome breakfast, I could barely make myself eat the delicious fruit and scrambled eggs that were served. The Children’s Center hadn’t opened yet, so I brought him along to hang with me while I gulped some coffee and pretended to eat. He asked me lots of questions about my ski school, while snagging my half bagel off of my plate. 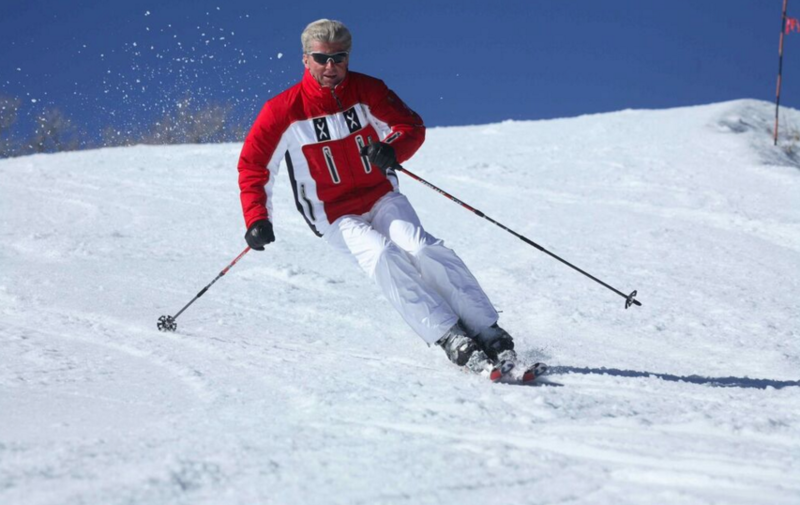 As soon as it was time to drop him off at ski school, we walked over there, and the staffers there got a good laugh as I seemed to fly out of the room. “We love seeing how the parents seem to feel free as they leave, it’s hilarious!” Little did they know that nerves alone propelled me. After a delicious run on the freshly-groomed Little Kate, both instructors agreed we were likely in the correct slots, but that we should do several runs together before splitting off. After a few drills on Bald Mountain (wherein every one of us complained of our disdain for the top portion of that hill) we reshuffled a tiny bit, and wound up with four in each group. Leticia eased us into more drills, and got us working on our stance so that we’d carve stronger and more controlled turns. Interspersed with instruction were various crucial safety tips. “I can’t stress enough how important it is to be safe on the mountain,” she said. “Almost every injury is preventable, and almost every crash between two people is preventable. People forget that simply falling down is an option if you can’t stop from an upright position.” Her tip for falling? Make sure your feet are below you, so you don’t have to hike up to get your equipment if it falls off—and so you can, presumably, use your skis to stop you. On the chairlifts, we got to know each other. One of our group had just retired from a career in business consulting, another sold her advertising agency a few years ago, and a third is a rock climbing, spin-class addicted thrill seeker who happened to be a 65 year-old practicing psychologist. Once we split off into our final groups (landing with an exact four-and-four setup), Leticia asked our small group to introduce ourselves and to share our reasons for signing up in the first place. I explained that as my older son enters his fifth season, he’s poised to surpass my skill set. The other women laughed knowingly. Their kids are older, and they’d long ago been left behind. We agreed that this weekend was our vehicle to change all that. The toughest moment of the first day happened on our first run after lunch, when the fearless psychologist had two successive yard sales on Sidewinder. Having seen her ski all morning, the falls seemed out of place. We noticed her boots were not fitting the bindings properly, and on the ride up Northside lift, found that she’d picked up the wrong skis after lunch. Let this be a lesson: Always, always, double check that the rental skis you are taking after lunch are the ones labeled with your own name. Our pal missed the remainder of the clinic, due to torn meniscus in her knee, which was a direct result of the fall. It was an honest mistake with regretful consequences. The rest of the group felt her absence the rest of the weekend—we all agreed she was the strongest skier in the group, and lots of fun on the chairlift, too. But under Leticia’s excellent enthusiastic direction, we forged ahead. If you’ve ever heard the term, “No rest for the weary,” this would be the weekend that exemplified it. We were still laboring under an adrenaline rush from our morning accomplishments, carving turns with the kind of power and control we’d always admired in others but never been able to replicate. 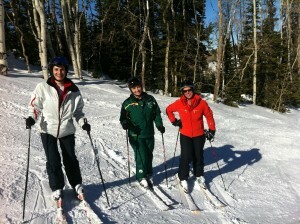 So when Leticia offered to take us on some “starter” bumps and trees near the Red Cloud lift, we agreed. “You can always bail out,” she said, wisely. Collectively, my new friends and I shared the attitude that we’d signed up to learn and we wouldn’t pass up an opportunity to try terrain we’d always avoided. We three moms started making mental notes of trail signs and terrain lingo with which to dazzle our kids (2 in college, 2 in middle school and my two). We also shared some laughs at our own expense, and made sure to egg each other on to push harder. As we regrouped Saturday morning, our crew of four, including Leticia, hopped on to Carpenter with a plan to ski over to Deer Crest. Swiftly, we compared notes on how much ibuprofen (dubbed “Vitamin I” by our clever instructor) we’d consumed the previous night, and how soundly we’d slept. Chairlift chatter ranged from discussion of technique to work-life balance (recurring theme for skiing moms) to each of our desire to make the most of the weekend—from skiing skills to bonding new friendships. The video analysis was amazing—we got to see how well we were skiing (really, truly, better than we had been the previous day) and what the next steps were to improve. Sweet. The afternoon was spent with better carving, smarter moguls and lots and lots of laughing as we worked our way around Empire. Leticia has superpowers of perception, plus an uncanny ability to find the least populated slopes on the hill. We rarely had to contend with crowds. I should add that the weather was beyond cooperative. For crying out loud, the bluebird was redefined, and someone missed the memo that it’s the end of January, not March, because we were downright hot under the sun every day. (Day three also marked my birthday—and the end of my birthday weather curse. Every year for the past ten my birthday registered high temps in the below-zeroes, so cruising in the sunshine in the 30s was hard to believe). Day 3 dawned pink and hazy, and it took a while for the sun to find its way to our slopes. In the meantime, I cracked wise that I’d watched the X-Games the night before, gotten inspired and wondered if Leticia was ready to teach me a 1080 flip. Right. She got her revenge—announcing our first run of the day: Tycoon. No joke. “What? You warmed up on Silver Link and McHenry’s!” Okay, then. Surprisingly, we were up to the challenge. The bulk of the morning was spent lapping Stein’s Way and Perseverence bowl, experimenting in packed powder and practicing carving. Leticia so perfectly layered each day’s lessons so that she continued to build on our skills. Every run improved on the last, or built on concepts we’d been working on in stages all along. We were also lucky because we found the magic of a well-gelled group. From the encounters we all had with the other women in the clinic, it was clear that we’d all approached it as an opportunity to improve our skills and find some fun companionship. 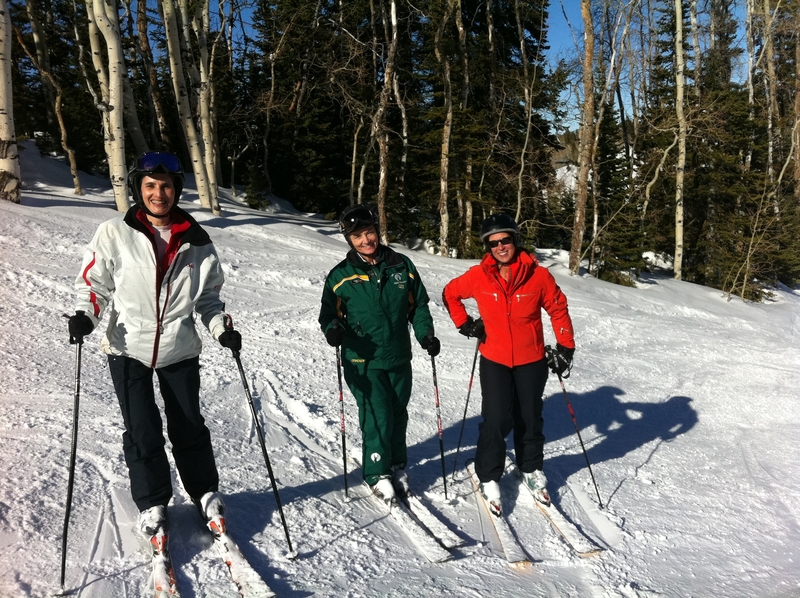 I will say that I’m grateful my group are part-time residents of Park City, so that I now have two new ski buddies to call upon. 1. 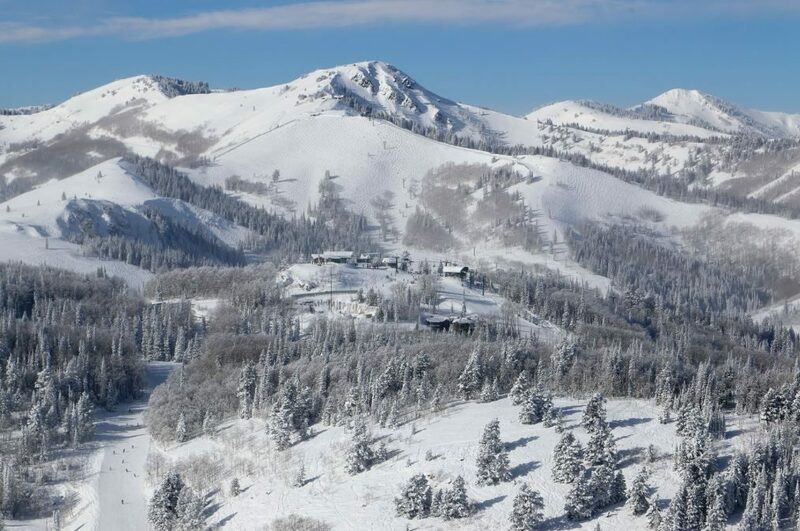 Discovering Testosterone Ridge—and skiing on by. Have you ever noticed the lineup of guys perched at the edge of the ridge above Solace/Conviction/Domingo runs on the face of Empire? Yes, there was the occasional female, scouting the perfect line, but as we did laps on Orion, our group noticed an overwhelming number of guys lined up and egging each other on. Thanks, but no thanks. 2. Writing new lyrics to Happy Birthday. 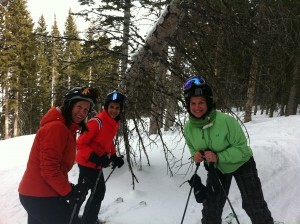 “Happy Birthday To Me, I skied in the trees! !” My new pals (instructor included) sang along. Leticia got us warmed up to tree runs slowly, first by getting us over our fear of traverses and moguls (more on that in a second) beginning the first day, and building on that the following two days– and then by asking us if we wanted to check out the tree runs on the way to Empire on our last day. There was a very pregnant pause. “Did you notice, nobody wants to say ‘chicken’ and nobody wants to say ‘Yes? !” I observed. Wonderful, inspiring Leticia said, “You can do this, let’s go.” And we did. Before long we’d checked out every kids’ stash in the resort and then after lunch the big time: Anchor Trees. We liked it so much we did it twice. See also: Wedge, below. 3. Rediscovering the wedge. For reals, peeps. You know how you’ve been shamed out of the wedge—and how you hound your kids to lose theirs, fast? It turns out it’s a useful tool. And when executed as a “Christie Wedge” it looks graceful and powerful. That’s cause it is. Leticia cites it as the best tool for controlling speed in moguls. What can I say? It gave us bragging rights, galore—useful in the trees, too, where terrain is choppy, and there are lots of “Whoop-te-dos,” which look and feel exactly like they sound. 4. 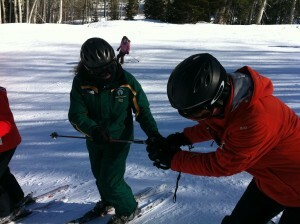 Getting safety and ski etiquette tips from a pro. Sometimes even having the right of way isn’t enough. When in doubt, cede it. If there’s a skier making wide traverse turns at the top of Stein’s Way, slow down and let him keep going. You’re in no rush, and it’s better to be safe than crashed. If nothing else, Leticia validated our already-ingrained common-sense moves. 5. Oh, yeah, celebrating my birthday with new friends (who went so far as to snag a piece of chocolate peanut butter layer cake, with candle, at lunch and got the whole room singing).